Your hip is one of the most flexible joints in the body; allowing you to run, jump, and walk. This ball and socket joint provides a smooth surface for bones to glide past one another, creating stability and broad range of motion. From a hip replacement or hip arthroscopy, groin pain, limited motion and/or hip arthritis, physical therapy is a treatment option for hip rehabilitation. 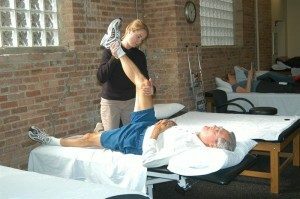 Return to play: Patient must have appropriate range of motion, strength, endurance and flexibility as well as pass both a Functional Movement Screen test and Y-balance test.